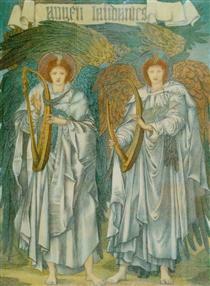 Sir Edward Coley Burne-Jones, 1st Baronet ARA (28 August 1833 – 17 June 1898) was a British artist and designer closely associated with the later phase of the Pre-Raphaelite movement, who worked closely with William Morris on a wide range of decorative arts as a founding partner in Morris, Marshall, Faulkner & Co. Burne-Jones was closely involved in the rejuvenation of the tradition of stained glass art in Britain; his stained-glass include windows in St. Philip's Cathedral, Birmingham, St Martin in the Bull Ring, Birmingham, Holy Trinity Church, Sloane Square, Chelsea, St Martin's Church in Brampton, Cumbria (the church designed by Philip Webb), St Michael's Church, Brighton, All Saints, Jesus Lane, Cambridge, St Edmund Hall and Christ Church, two colleges of the University of Oxford. 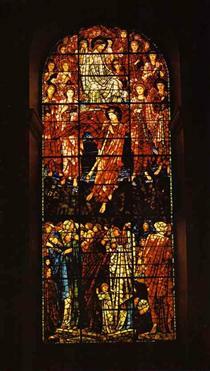 His stained glass works also feature in St. Anne's Church, Brown Edge, Staffordshire Moorlands and St.Edward the Confessor church at Cheddleton Staffordshire. 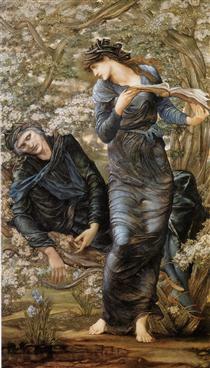 Burne-Jones's early paintings show the heavy inspiration of Dante Gabriel Rossetti, but by the 1860s Burne-Jones was discovering his own artistic "voice". 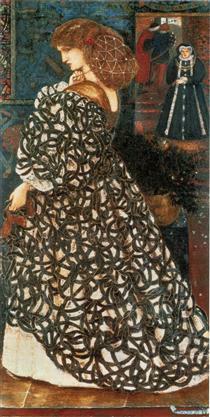 In 1877, he was persuaded to show eight oil paintings at the Grosvenor Gallery (a new rival to the Royal Academy). 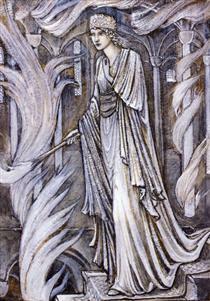 These included The Beguiling of Merlin. 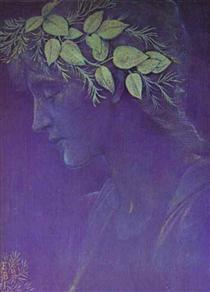 The timing was right, and he was taken up as a herald and star of the new Aesthetic Movement. 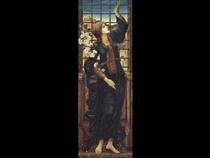 In addition to painting and stained glass, Burne-Jones worked in a variety of crafts; including designing ceramic tiles, jewellery, tapestries, and mosaics. 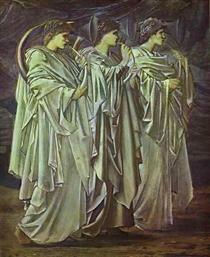 Edward Coley Burne Jones (the hyphen came later) was born in Birmingham, the son of a Welshman, Edward Richard Jones, a frame-maker at Bennetts Hill, where a blue plaque commemorates the painter's childhood. 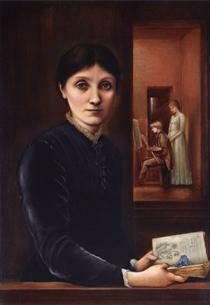 His mother Elizabeth Coley Jones died within six days of his birth, and he was raised by his grieving father and the family housekeeper, Ann Sampson, an obsessively affectionate but humourless and unintellectual local girl. 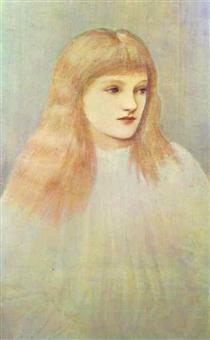 He attended Birmingham's King Edward VI grammar school from 1844 and the Birmingham School of Art from 1848 to 1852, before studying theology at Exeter College, Oxford. 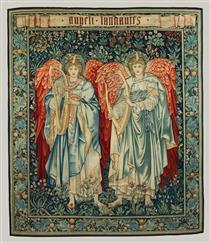 At Oxford he became a friend of William Morris as a consequence of a mutual interest in poetry. 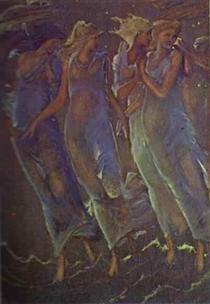 The two Exeter undergraduates, together with a small group of Jones' friends from Birmingham known as the Birmingham Set, speedily formed a very close and intimate society, which they called "The Brotherhood". 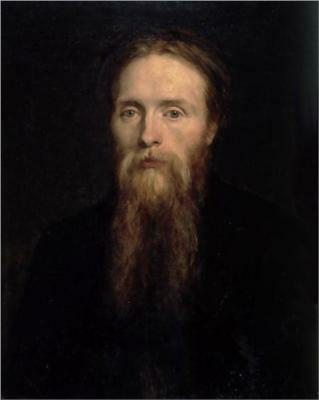 The members of the Brotherhood read John Ruskin and Tennyson, visited churches, and worshipped the Middle Ages. 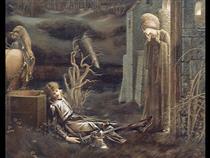 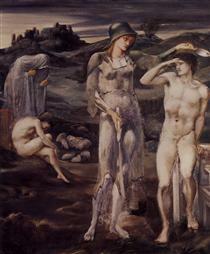 At this time Burne-Jones discovered Thomas Malory's Le Morte d'Arthur which was to be so influential in his life. 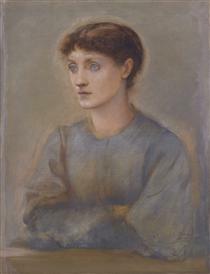 At that time neither Burne-Jones nor Morris knew Gabriele Rossetti personally, but both were much influenced by his works, and met him by recruiting him as a contributor to their Oxford and Cambridge Magazine which Morris founded in 1856 to promote their ideas.